TH E M R EP O RT | 39 O R I G I NAT I O N S E R V I C I N G DATA G O V E R N M E N T S E C O N DA R Y M A R K E T ORIGINATION 2017 | © Old Republic Title | Old Republic Title's underwriters are Old Republic National Title Insurance Company and American Guaranty Title Insurance Company oldrepublictitle.com Title Insurance | Real Estate and Mortgage Loan Settlement Services | National Commercial Title Services Mortgage Servicing Solutions | Default Management Services | Real Estate Information Services Real Estate Valuation Services | Flood Reports | Section 1031 Exchanges | Notary Services Nationwide Commercial Due Diligence Services | Nationwide Commercial Survey Services Relocation Services | Timeshare/Fractional Interest Services | Residential Information Services For more than a century, Old Republic Title has been doing business with integrity. 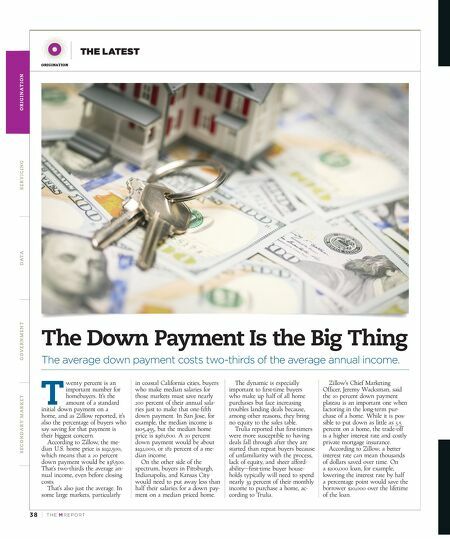 We make it easy for our title agents to succeed. Accessibility, underwriting prowess, unsurpassed fi nancial strength, convenient resources and support. Visit oldrepublictitle.com/rightway to learn more! Meet Jackye. Hiker. Mentor. A 33-year Company veteran. 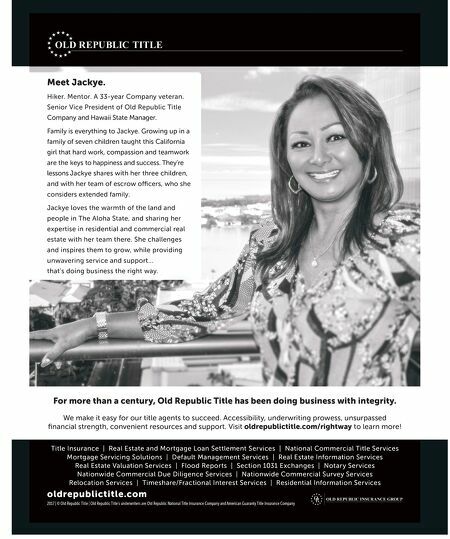 Senior Vice President of Old Republic Title Company and Hawaii State Manager. Family is everything to Jackye. Growing up in a family of seven children taught this California girl that hard work, compassion and teamwork are the keys to happiness and success. They're lessons Jackye shares with her three children, and with her team of escrow o" cers, who she considers extended family. Jackye loves the warmth of the land and people in The Aloha State, and sharing her expertise in residential and commercial real estate with her team there. She challenges and inspires them to grow, while providing unwavering service and support… that's doing business the right way.